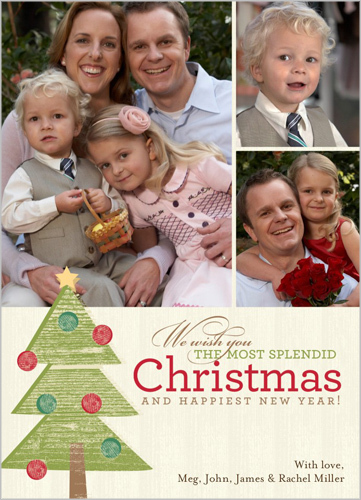 I'll admit, up until last year we were spending way too much money on holiday cards. They had to be the best, after all. Then last year we discovered that the best doesn't have to be overly priced at all, and could be found at Shutterfly. 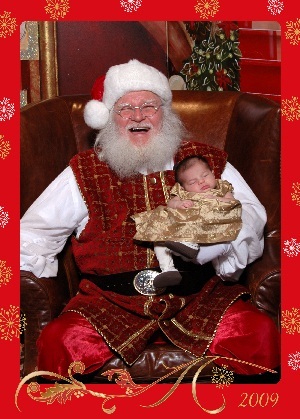 I had heard of Shutterfly before, but we didn't try them until last November when we took our 2 week old peanut baby girl to see Santa at the local mall. The pricing package that we chose included a USB drive with our photo on it, as well as a $20 credit to Shutterfly, which of course we used!! Look at how tiny my little princess is here... she didn't even wake up for the entire event. Anyways, the entire process made it so easy to get prints for our entire family in the sizes they wanted, and we were able to find matching cards that we loved. And as I mentioned, picking out the Christmas card is my biggest challenge, only because there are so many wonderful cards to choose from!! ﻿While I was browsing I also found these wall calendars that will make the perfect stocking stuffers for grandma and grandpa! Shhhhhh, it's a secret! I know it's not even Halloween yet, but I'm so excited for the holidays! I think having kids adds in all the glitter and magic of the season that we felt as kids. When do you start planning for the holidays? i use yorkphoto.com whenever i order pictures now, but i've used shutterfly in the past and their calendars come out great. i usually make a calendar with my fav pictures from the past year. and my mom (who still sends out photo cards though we are all grown up) gets them printed from shutterfly too! What a cutie! I thought I liked the Splendid Tree design the best but Holly Frame is my overall favorite. I love the simplicity and how well it would feature a fun picture! I'm with you on loving getting photo cards, plain old holiday cards without them just aren't nearly as exciting to look at! PS I still have last year's Christmas photo hanging up on my wall! If Your Kids Play Sports, Protect them from MRSA! Fall Family Challenge: L is for Lots of Leaves! !